It remains a myth to me why “Made in China” is becoming cheaper not more expensive. Do you agree that it is a sign that Chinese apparel exporters are lowering the selling price to keep their sourcing orders? The U.S. will always import from China. Although the section 301 tariff may temporarily decrease how much the U.S. imports from China, I think the U.S. will quickly go back. Apparel imports from China are not only cheap, but made quickly and in mass amounts. The U.S. consumer today often values quickness over quality. The factor that may hinder trade between the U.S. and China is many Americans want their products to be made in America. what you do mean “the U.S. will quickly go back”? 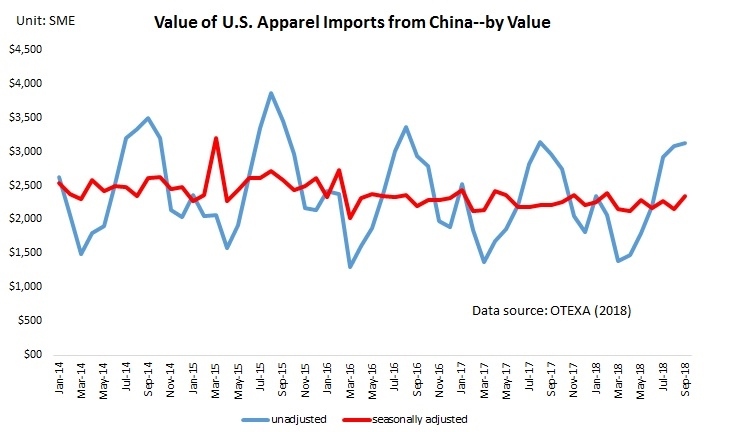 Are you suggesting the decline of China’s market share in the US apparel import is temporary in nature? this is an interesting point, but why is that? Even with the section 301 I believe the U.S. will still continue to import from China. This takes me back to the article we read about Apple products and their production and how the U.S. simply could not compete with China when it comes to how quickly and efficiently they are able to produce products and have many workers willing and fighting for jobs like these. I don’t want to say the section 301 will have no impact, I believe the U.S. will try to focus on what they can produce locally rather than going to global vendors but I don’t see them shying away from China just yet especially with their cheap costs. I find it interesting how imports from China into the U.S. seem to consistently go up and down due to market uncertainties. The companies importing from China may decrease their imports a little but they most likely will never stop importing from China due to the low cost of goods and the fact that there seems to be no perfect replacement for “Made in China” due to issues with other exporting countries such as Bangladesh and Vietnam even when the new tariffs are imposed. However, U.S. companies are diversifying who they are importing from so that they can cover their bases, which is smart with the increases in tariffs and changes of trade policies. I also find it interesting that imports from China are probably going to increase all at once due to the tariffs and companies wanting to lower their costs. With the section 301 being put into place I still don think that the Untied States will stop imports from China. It even states it above that their really is no replacement for the ” Made in China” tag that we see on most of our clothing. Though this does open up new opportunities for other countries to have more exports to the U.S. For example, Vietnam has been increased with exports. Also it has helped the U.S to increase their own apparel manufacturing , from 92.8 to 94.3. The reasoning I believe that the Untied States wont shy away from having imports from China is due to their cheap, efficient and speedy production. Though some companies might look to other countries like Vietnam and Bangladesh overall I don’t believe that the U.S as a whole will decrease their imports from China that significantly. Although Section 301 may lead some companies to look for sourcing elsewhere, I do not believe that this will stop a majority of the sourcing companies choose to do in China. As we have been learning, many companies have been looking for other reasons besides low cost when choosing where to source. If China offers shorter lead times and higher flexibility, they may still reign the no.1 apparel supplier for the United States. Considering China is also reducing their prices to counter the implementation of section 301, I still believe many companies will continue sourcing in China for other beneficial factors besides cost. 1. It is not correct to combine China with being cheap only. China is one of the few countries which is able to deliver high-quality goods in a quick and reliable way. Manufacturers there have invested a lot in equipment and people – and China has its own raw materials. 2. It is a myth that apparel brands can switch their suppliers like we change our underwear. From a certain quality level on it takes a while until a producer understands the needs of the buyer in terms of fashion, quality, social responsibility, standards, administration …. Finding professional suppliers is already difficult – changing them is far more difficult. I feel like the import from China or in another word “Made in China” will decrease in the long run in the future. Not only because the tariffs are increasing, but also the nature of how China would like to contribute to the world is changing, from Chinese perspective. Products with lower value could be produced in countries with lower labor cast or wherever is cheaper than Made in China. And I believe that China doesn’t care about those lost orders. At the main time, China is improving its technology and other skills, which leads China to a higher level and looking for to become a developed country in the future. China might just focus on a significant part which China has the absolute advantage over it and labor intensive is no longer the absolute advantage for China I believe. We will find out. I agree. As mentioned by our guest speaker yesterday, US fashion brands and retailers have been actively seeking China’s replacement. It is impressive that those large companies are working with hundreds of vendors around the world. I think these companies will have the resources to adjust their sourcing portfolio. That being said, i am not so sure about relatively small and medium-sized retailers. It takes time to select and build relationships with new vendors. Over the summer, I was an Assistant Buyer intern for Ross in our Home department. Towards the end of the internship is when news of the first round of tariffs had just broken out, and it created a huge frenzy in the office, especially because a lot of my department, Garden, was affected immediately. However, we source through third parties like Li & Fung, and I was able to sit in on a few conference calls with them to talk about our options. Ultimately, the factories we were working with did not want to lose our business, so they lowered their prices to compensate for the tariffs. I believe that even though people think America depends too much on China, China also depends on America, and they are going to continue to push through these tariffs in order to keep large orders to American companies. I believe that, for the foreseeable future at least, America will continue to manufacture in China. this is VERY interesting! Thank you so much for sharing!! I should invite you to share your observations with the whole class! I believe that the United States will continue to to import from China because they are the #1 exporter to the United States. Apparel made in China are becoming even cheaper. It is likely that Chinese exporters are reducing their price to keep their orders and overcome the challenges caused by the Section 301. There is also no perfect replacement for the United States to use instead of China. It is in the United States’ best interest to keep importing goods from China, regardless of the Section 301. The U.S. will continue to import from China while continuing to diversify because “going out to market” makes China strive to remain competitive. There are myriad options but as long as China remains price competitive it will be hard for the U.S. to ignore the cost advantages. The other options present additional challenges and China will always work to be on the cutting edge of technology . As regulations and competition encourage other countries to challenge China for the number one spot, there will likely be more parity among the nations from which the U.S. imports. It is extremely confusing to me how imports from China have gotten less expensive, especially because I thought that in recent times many companies have moved to manufacturing their products in other countries like Bangladesh due to the fact that the cost of labor was becoming higher in China, resulting in the increase in the price of imported products. However, it is interesting that this is the result of this. While the US is still attempting to find a replacement for China, I do not believe that they will ever be able to find a permanent one. The world is constantly changing and although some countries may be far behind, it is inevitable that they will eventually catch up and adapt to changed ways. 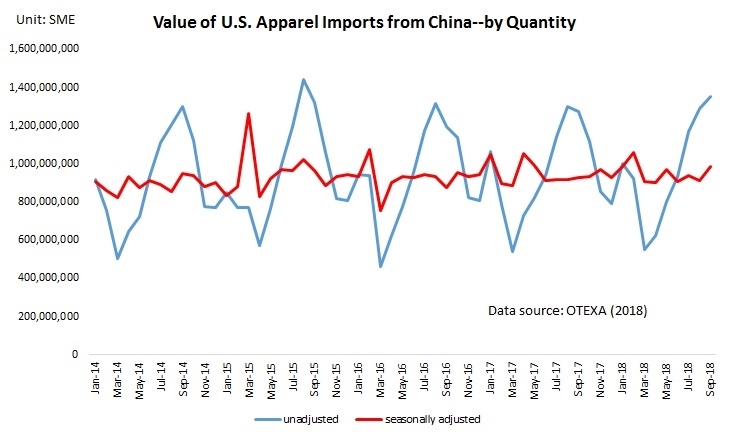 The apparel trade flow has started to find new apparel sourcing destinations, access trade flows, and learned to manage tariffs. 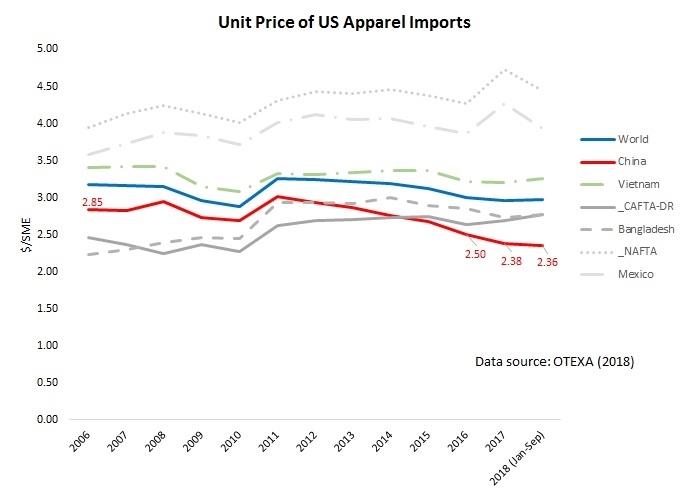 It is extremely interesting to see how these tariff hits are currently effecting apparel sourcing because I was able to see first hand how it effects a brand. After interning at a company called Rebecca Minkoff as a public relations intern this past summer, I was able to see first hand how the sourcing, design, and financial sectors were affected by the first round of tariff hits. As it was mentioned in the reading above, sourcing managers at the company began scrambling to finish their orders ahead of time before any new tariffs hit. Our guest speaker on Monday emphasized something very important to any sector in the fashion industry. Every decision department made by individual sections of a company, will directly or indirectly effect another. For example, if a sourcing team changes where they import their apparel from, it will effect the designers and merchandisers because of pricing, textiles, and raw material and trading costs. As for China, with their prices continuing to drop, it will be hard for US to stop importing from them. These low costs will keep brands who are price conscious coming back, time and time again. Even with the section 301 in place, I believe the US will continue to import from China. As stated above, there really is no replacement for the “Made in China” tags on our clothing. Apparel made in China is becoming even cheaper and it’s likely that this is happening in order for Chinese exporters to keep their orders with US companies and overcome the challenges caused by the section 301. I think it is in the US best interest to keep importing goods from China, regardless of the Section 301. Imports from China are cheap, and they provide speedy production. If “Made in China” apparel is becoming cheaper, what does this mean for people working in labor intensive countries such as Bangladesh, Vietnam, and India? Also, what is the MOST influential factor that drives the US to source less from China? I think it is because we want to export more than we import. I read an article saying that the Chinese government does not want the words ‘trade war’ included on news articles pertaining to the weakened exchange rate and the fall in the stock market index. It sounds like they are feeling major pressure in regards to how to handle the narrative. Trump tends to speak candidly on this issue on social media platform, Twitter, yet Twitter is banned in China so people are not aware of his comments. What I want to know is— Why is the Chinese government afraid to reveal all information and events pertaining to this? In my opinion, I think the US will always continue to import from China, even if we import less. I’m surprised but at the same time I’m not. The US is deeply invested in it’s trade agreements with China and for as long as I can remember, “Made in China” stickers have popped up on plenty of products I’ve owned. While the tariff is an inconvenience, finding an alternate solution may be more most costly and an extensive process. The lead times and costs of sourcing from China are unbeatable although the tariff may also act as an influence to move brands outside of China. Other Asian countries such as Bangladesh are seeing increased exports. Since a majority of these exports are imports from China, US brands can still source those products they would from China but from Bangladesh. I think China’s price reaction to the section 301 tariff is very interesting but not surprising. It seems a natural reaction for China to reduce their prices in order to persuade US firms to continue producing there as the US is its number one source of business. I also believe however hat this is a short term fluctuation as Chinese firms will not be able to offer such low prices and also accommodate Chinese wage requirements. I also believe that overtime the US will not be China’s number one source of business (specifically looking at the textile and apparel industry) regardless of President Trump’s tariffs. China is becoming and increasingly advanced country and as such will move into more capital intensive industries and more firms will move as many have been to cheaper labor, I do not believe that China will hold their competitive advantage of cheap labor for very much longer. Next Next post: What Do You Take Away from FASH455?